Italian architect Carlo Ratti has designed a system for an office in Turin that instructs heating, lighting and cooling systems to follow occupants around the building like an "individually-tailored environmental bubble". 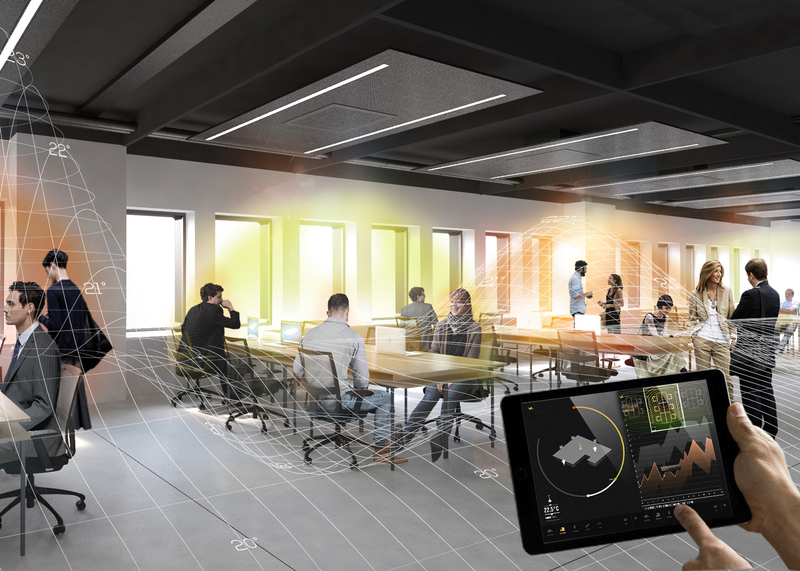 Carlo Ratti Associati's Office 3.0 will use a system of sensors to monitor employees as they move around the headquarters of the Agnelli Foundation cultural institution. The technology – known as the Internet of Things – employs a series of Wi-Fi-connected sensors to monitor environments and collect sets of data, then uses the information to send instructions to products and services within the building. In this case, the data includes occupancy levels, temperature, CO2 concentration, and the status of meeting rooms. The building management system (BMS) can tell the lights to switch off if a room is empty, and heat meeting rooms just before they are due to be occupied. By tailoring the heating and lighting to the needs of individuals and groups, the firm believes the office could cut significantly energy use. "Today, a lot of energy is wasted heating or cooling empty buildings," said Ratti, who is also the director of the Senseable City Lab at MIT. "By synchronising energy usage and human occupancy within buildings, we can create a more sustainable and responsive architecture – theoretically slashing energy consumption by up to 40 per cent." Occupants can also set their preferred temperature via a smartphone app. The fan coil units situated in the false ceilings will be activated by human presence, so a "thermal bubble" will follow individuals around the building. When an occupant leaves a space, the room will automatically return to "standby mode" to save energy. The system is designed to learn daily routines and usage patterns, which will allow the workplace to be adapted accordingly over time. The Agnelli Foundation's offices will feature movable glass walls, sound-absorbing curtains, and foldable partitions made of wooden panels – all of which will allow for reconfiguration from large open spaces to series of smaller rooms. The offices occupy a historic building in Turin. The fitout is set to commence on 6 June 2016, and the renovated Agnelli Foundation will be inaugurated in spring 2017. It will also feature a co-working space, a Fab Lab educational research centre, workshop areas for students and entrepreneurs, and a cafe. Ratti's teams worked with the Fiat Chrysler Automobiles group, which has close ties to the foundation, on the project. Fiat was founded by Giovanni Agnelli. "Sensors and localised climate control are already established features in the car industry," said John Elkann, vice chairman of the Agnelli Foundation and chairman of Fiat Chrysler Automobiles. "With Carlo Ratti Associati we are now exploring how such solutions can impact architecture, using the Internet of Things." Carlo Ratti Associati hopes that the internal positioning system it has developed – which works similarly to GPS – will provide a platform for a range of applications in the future. "This open platform for occupants, employees, and guests will further evolve over time, through crowd-developed apps and software updates," said Ratti. The architect's previous work with sensor technology has resulted in a ceiling-mounted installation that directs personalised "clouds" of water vapour at anyone walking beneath. More recently, Ratti launched the "world's first Internet of Things sofa" – a system of smart modular seats that can be adjusted with an app or hand gestures into different configurations.